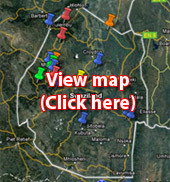 Welcome to the SwaziLive Accommodation Directory for Swaziland, Southern Africa. Swazilive offers visitors a wide range of holiday accommodation in Swaziland, from budget friendly accommodation and lodging at Backpacking Lodges and Hostels, to Caravan and Camping sites in Wildlife Reserves, Self Catering accommodation in Holiday Villas, Flats, Apartments and Guesthouses, Bed and Breakfast accommodation in Cottages, Guest Houses and Hotels, and Luxury accommodation at Top Hotels, Game Lodges and Spas. What ever your preferred choice of accommodation in Swaziland, look no further than SwaziLive! To make your search for accommodation in Swaziland precise and quick, we have supplied a number of search options. These options allow you to search by Swaziland Region, Swaziland accommodation type, Swaziland accommodation name or by Swaziland city or town. Swaziland is the last remaining absolute Monarchy in Africa. The Kingdom is run by a King and his chiefs. This ensures the many Swazi Traditions are adhered to and that today members of the Swazi tribe still perform the Swazi customs passed down through generations. One of the most famous of these is the Swaziland Reed Dance. By visiting one of the many Swazi Traditional Villages you will be able to see and experience some of these Swazi Customs. There is also no more hospitable and friendly person in Africa than a true Swazi. Swaziland is famous for its Swazi-sun golf course. But if you are prepared to divert a bit off the beaten track, you will find a nine hole golf course and country club in most of the towns. There is nothing to compare to a golfing holiday far from the maddening crowd, meeting new people, where green fees and caddy fees are still reasonable and the 19th hole serves them ice cold. The dams in Swaziland are well known for their fishing. Maguga Dam hosts various bass fishing tournaments through out the year and Van Eck is loved by the Swazi's for it tranquil setting where you can catch tiger fish while watching closely for Hippo's. Sand river is the place to visit if you enjoy water sports although at Van Eck you will often see a mad local waterskiing or jet skiing amongst the crocodiles. With the new highways linking Swaziland, South Africa and Mozambique, many tourists are finding it impossible to travel through Swaziland without at least an overnight stay. Beautiful game parks, Exquisite Game Lodges, Game drives, Safari's, breath taking scenery are a few things nature lovers will enjoy. Above are but a few of the reasons to visit Swaziland. With the warm hospitality, marvellous accommodation, exquisite scenery and the multitude of things to do you will enjoy your stay. "Welcome To SwaziLive’s Swaziland Accommodation Directory"